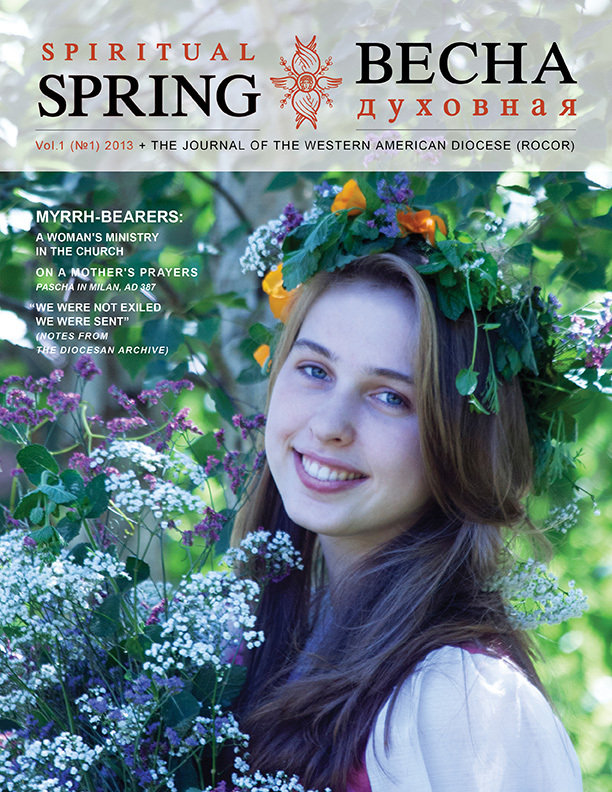 Western American Diocese - The Diocesan Journal "Spiritual Spring"
The Diocesan Journal "Spiritual Spring"
“Spiritual Spring” is a periodical addressed not only to members of the Orthodox faith but anyone interested in learning more about Russia’s spiritual heritage. The magazine provides a variety of perspectives and experiences, appealing to a broad range of interests and demographics. 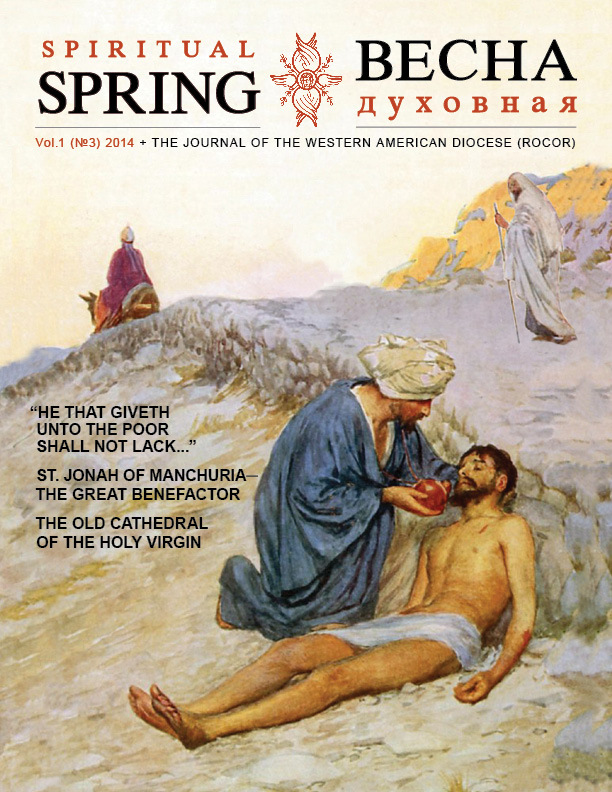 Thematically, the journal covers all aspects of Orthodoxy in the modern world. Readers can find answers to issues they face in everyday life while enjoying a deeper exploration of Christianity’s rich and multifaceted history. The versatility of the magazine’s design seeks to strike a balance between the modern and secular world in a way which is uniquely Russian Orthodox yet accessible to readers with other beliefs, as well as those who are simply curious. Great labors have been exherted since the time of the journal's inception. The Editorial Board with the help of benefactors and sponsors has produced three issues, with a fourth dedicated to the 20th Anniversary of the Glorification of Saint John of Shanghai and San Francisco forthcoming in the near future. On the 9th of February of this year, the Editorial Board organized its first "Presentation" in order to acquaint the members of the diocese with the editors, writers, translators and artists of the journal. An article on this first presentation has been written by a young journalist, Elena Mariakhina. See the article and photographs below. A second presentation is scheduled for May 24, 2014, at 2 pm at the League of Russain-American Women at 463 – 26th Ave, Suite 304 in San Francisco, CA. Readers can visit the «Spiritual Spring» Facebook page here. Very soon on that page will be posted biographies of the editors and authors of the journal as well as their photos. 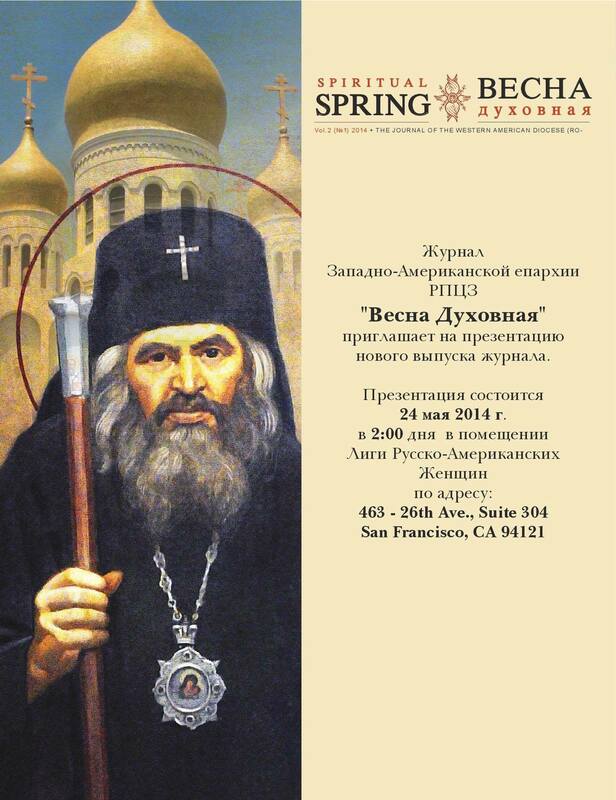 The First Presentation of "Spiritual Spring"
At the Russian Home of Saint Vladimir in San Francisco, California, the first Presentation of “Spiritual Spring”, the official journal of the Western American Diocese was held. On Sunday the 9th of February, 2014, while rain was incessantly and ardently washing the hilly streets of San Francisco, within the walls of the Russian Home of Saint Vladimir (at 376 -- 20th Ave.) it was colorful and warm. In the hall, in a corner, a lamp gently and peacefully glimmered before an ancient icon of the Mother of God. The floor squeaked slightly and the room smelled of wood and newly brewed tea. In this small, comfortable hall there gathered a special crowd, the kind you could find exclusively at a literary dinner or… at a presentation of “Spiritual Spring.” Here could be heard both Russian and English, however in the tone of the voices, one could deduce a common element that unified all who had gathered there: the capacity and desire to converse on very serious themes, to expand the limits of one’s knowledge about life, faith and God. As of the day of this Presentation two issues have come to light. When getting acquainted with both of them the reader can immediately comprehend and deeply sense the insightfulness and seriousness of the journal’s aims, which the laborers have placed before themselves. For the first issue, which came out around the feast of the Myrrh-bearing Women the theme of the woman’s role in the Church was chosen. 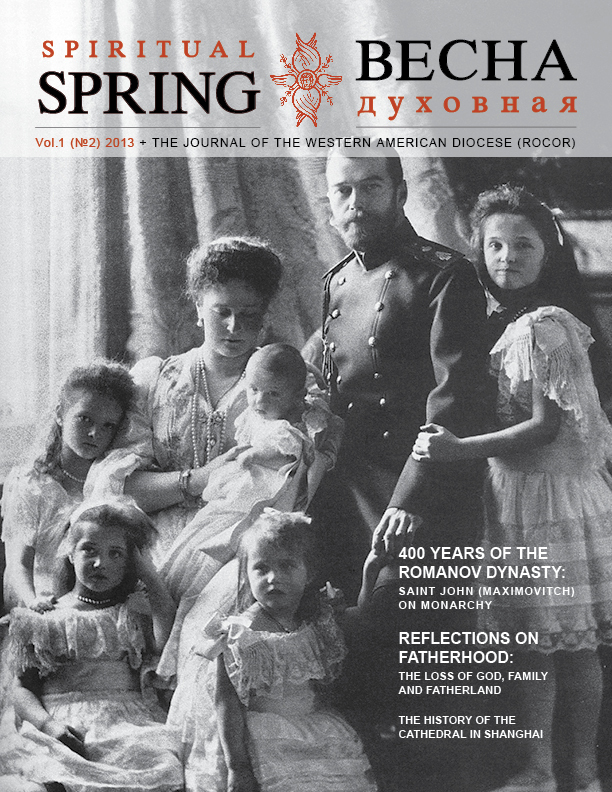 The second issue was dedicated to the 400 Anniversary of the House of the Romanovs and to fatherhood. The third number has come out just recently… the time has arrived for the reader to meet with the remarkable team through whose efforts and labors the journal is produced. First and foremost the journal is indebted for its inception to His Eminence Archbishop Kyrill of San Francisco and Western America, who has taken upon himself the duties of Editor-in-Chief and designated the people responsible for the journal. Zoya Gradova, the Executive Editor has invested much effort and soul into the publication. It was she that opened the Presentation. In every word, gesture, smile and her shining eyes could be felt love for the work in which she is involved, but also her belief in the necessity of this labor for others. In her talk she mentioned the aims given to the publication are to be a source of knowledge about the Orthodox Faith, Russian history and culture, and about being a means of harmoniously developing this great culture on American soil. Mrs. Gradova thanked the sponsors of this presentation: the General Consul of the Russian Federation in the person of Vyacheslav Slavkin and The Russian Home of Saint Vladimir in the person of Mikail Nikolaev for making the facility available for this event, and all of those who have made a contribution to the work of the journal and who have provided for the journal from the very beginning. The audience learned how themes, rubrics and materials for articles are selected step-by-step. They also learned how the editor of the Russian version, Natalia Ermakova and the editor of the English version, Liza Joanna Smith, labor day after day bringing style, grammar and punctuation to perfection. The formatting designer, Evelina Phemister, creates beauty through line and color. Readers were also introduced to Julia Godzukovskaya, who is creating an Internet presence for the journal, Igor Polishchuk a journalist and translator, Oxana Sopronova who manages subscriptions authored the photo report of the latest youth conference, and Maria Vrublyovskaya a translator. Following the talk by Zoya Gradov, a no less inspiring presentation was offered by the priest of the Old Cathedral Hieromonk James (Corazza), who is a member of the editorial staff. Fr. James has made important contributions in the founding of “Spiritual Spring.” He shared his vision of the role and mission of the publication, its aims in cultural and spiritual formation. The atmosphere of the evening was inexpressible, “when one soul communes with another,” being supplemented by the reading of a poem which the dramatist himself, Leonid Vinogradov, wrote for the first issue of the journal. In his verses was heard the sound of rain, in them was echoed his love for his historical home (Russia) and simultaneously for America, for those places where he lives now. His verses are a dialogue, begun yet not completed, a dialogue, behind which stand years of reflection, which nonetheless settle into the soul with ease and invoke in the reader a feeling of joy from life itself. The evening would not have been complete without the sonorous flow of Russian romances performed by Maria Alyakrinskaya, who had been interviewed in the first issue of the journal, and Kira Stakhovskaya. It is not possible for a Russian not to sing along when “The Long Road” is being sung. It is just as impossible to fully savor the strict posture and grace of the two performers, by the flowing movements of their arms, by the beauty of their eyes slightly dark, yet full of inner strength. How can one convey all that the soul of a man contains within himself? How does one unify into one the entire thread of history, culture and the spiritual path of many generations? For those who came to the this first presentation of the journal “Spiritual Spring” it was understood that human aspirations towards the knowledge of God and the path to Him can be expressed though the word, as the word is capable echoing and resounding in the hearts of men. “Spiritual Spring” was created so that through the written word again may be stirred in the hearts of readers themes that occupied our grandmothers and great grandmothers, and can possibly be spoken in a new way in our “overly-charged” age. In the Summer when the Russian Orthodox Church Outside of Russia will be celebrating the 20th Anniversary of the Canonization of St. John the Wonderworker, Archbishop of Shanghai and San Francisco a special edition is being prepared devoted to this great Saint. “Spiritual Spring” is still young and a long road is lays before it – a search for new themes for dialogue with readers, the gradual appearance of the journal on the internet and the expansion of subscriptions. For now a beginning has been made, and it remains to wish all of those who labor for this journal fortitude and faith. When the presentation was over the guests did not wish to move along. The rain had stopped, but in the hall, sipping tea, people mingled for a long time, discussed the possibilities for collaboration and thanked the organizers the gift of this amazing gathering. And, there was the general feeling that all of this is only the beginning.